What follows is a not-particularly-tragic tale on the virtues of patience and having a good sense of humor. During our last week in San Marcos, our black tank valve release (of the cable variety) broke, making it very difficult to open and close the tank. In fact, I wasn't strong enough to do it; only Josh was. 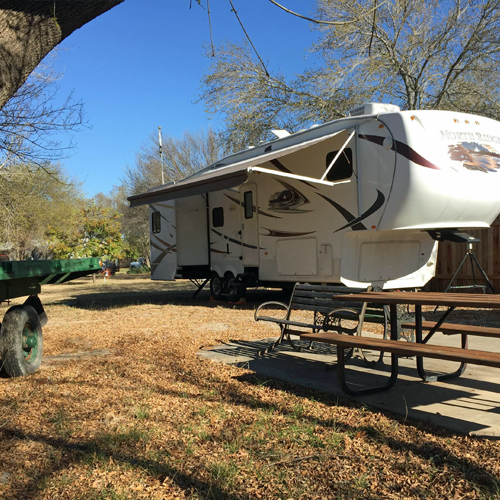 Fortunately, our friends Eric and Brittany Highland of RV Wanderlust knew about a great RV repair place in San Antonio: Iron Horse RV. I called and made an appointment to come in on Friday, January 30th for what we hoped would be a quick fix. When we arrived, Daryl, the owner, and Justin, the front desk manager, gave us a warm welcome and took our rig right in. Apparently forklifts are strong enough to tow 36' 5th wheels. Who knew. Josh and I settled in for a day of working in the truck, keeping company with our pitifully meowing cat and sleepy dog. Pitiful cat too pitiful to share. We got the bad news around the end of the day: the part that was needed to fix the valve would have to be ordered. Iron Horse said they would overnight it so they could finish the repair on Monday. In the meantime, they'd already solved a smaller problem with our refrigerator that we'd asked them to inspect. They kindly towed our rig to their parking lot in the back where we were hooked up with water and electricity for the weekend. They didn't charge us a penny for the stay. When Monday rolled around, we received further bad news. Although they had paid to overnight the part as promised, the seller had mistakenly shipped it via ground. The new repair day was to be Thursday. 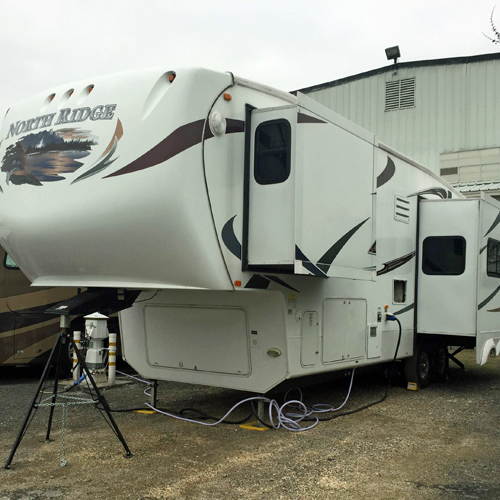 It wasn't easy waiting, but the Iron Horse folks were good to us, taking a look at everything we questioned about our rig and even airing up the tires for us. 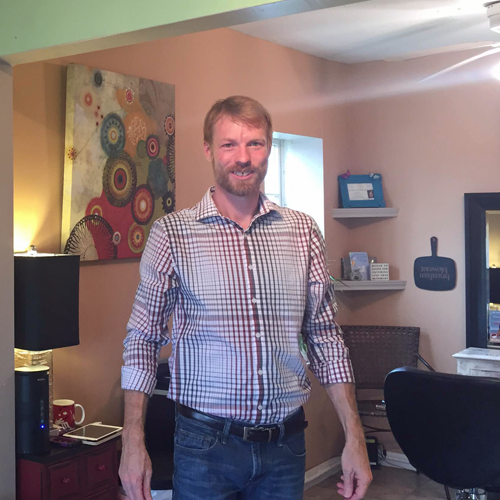 Besides, having some time in San Antonio gave me a chance to get a much-needed haircut. After all the bad news, I was in the mood for something fun. Fortunately for me, an awesome stylist was right around the corner: Troy Dow at All That Hair. I loved my experience here, from the welcoming salon owners and friendly salon kitties to Troy's amazing job with my lifeless hair. The price was extremely reasonable, and Troy and I got on so well he gave me a big hug before I left. It was enough to make me wait until I return to San Antonio for my next hair cut! 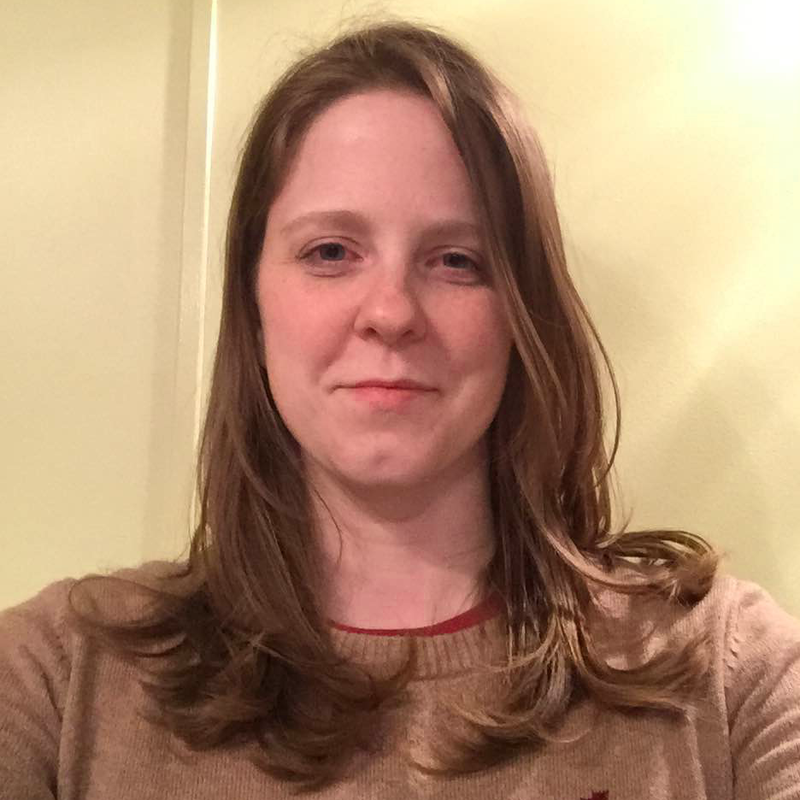 Obligatory post-haircut selfie. This is from 10 hours later, but it still looked good! 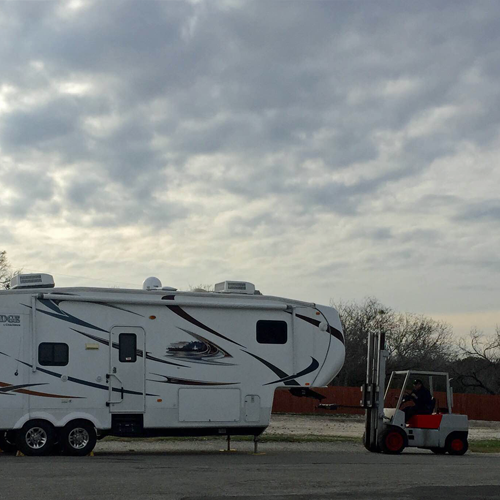 When Thursday arrived, and the part along with it, we piled into the truck again to let the Iron Horse RV folks do their business while we headed to a laundromat to chip away at our pile of dirty clothes. We got the call near the end of the day that everything was ready, so we started back towards Iron Horse RV, stopping along the way to fill up Dovahkiin with diesel for the morning's journey. When we started the truck again, it immediately turned itself off. Then it wouldn't turn on at all, sounding like it had a dead battery. Finally, we got it to crank. Along with the small victory came something worrisome: a wrench icon that the user manual interpreted as "limp home mode," meaning it needed to get to a mechanic immediately. So we took off, first dropping off the animals at Serenity, then surrendering Dovahkiin to the only Ford dealership on our side of San Antonio that could get it in right away: Northside Ford. We learned in the morning that the truck needed a new fuel pump... and everything remotely related to the fuel pump. The good news was they could fix it that day. And fix it they did. For a pretty penny, which stung all the more after finishing our paperwork with Iron Horse earlier that morning, but the truck ran like butter. An expensive day it might have been, but it was worth it to have a working black tank and truck again — especially considering we didn't expect to see a city with a six-figure population again for five weeks. It's far more comforting knowing we're heading into the desert with a solid rig and tow vehicle. 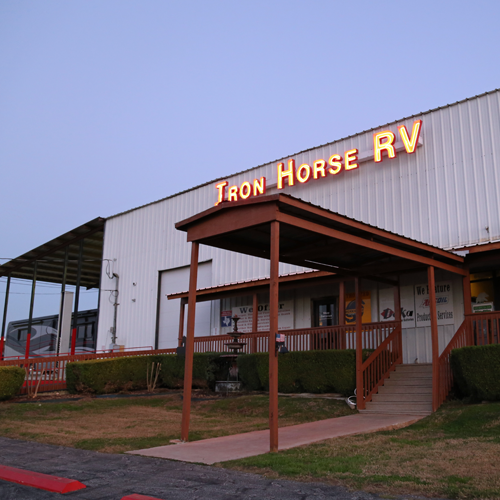 All in all, we were happy with the service provided by Iron Horse RV. We felt they did a thorough job, especially under the watchful (and possibly all-knowing) eye of owner Daryl Waldrop. And while it wasn't free, the cost wasn't outrageous, either. Josh and I were impressed with the many services the place provides, from basic mechanic fixes all the way to top-notch paint jobs. We'd definitely come back. Same story with Northside Ford. They got us in quickly, were super professional, and completely resolved our issue in less than 24 hours. Considering a dealership in Houston once asked me, "Are you prepared to leave your truck here for 2 weeks so it can get in line to get diagnosed?" I was impressed with the rapid turnaround time at Northside. On Saturday the 7th, a week after we had initially intended to leave San Marcos, we left San Antonio and made our way west to the small city of Del Rio on the Mexican border. Our abbreviated adventures here have just begun, but we're glad everything turned out well in the end. 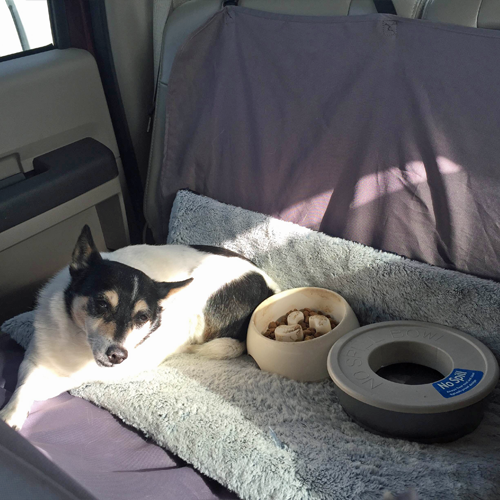 We made new friends and feel much more secure about the safety of our home on wheels. Tell us your unexpected repair story. Have you been held back from adventure only to be grateful in the end?